Who is up for some spicy time at Moon Games Casino? 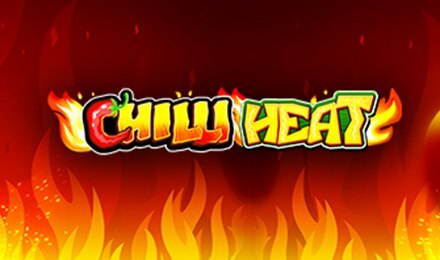 Join in the fun with Chilli Heat Slot, a sizzling five-reel slot game that seems to keep the heat of excitement ever high! Chilli Heat Slot is a release of Pragmatic Play. Yes, the very Pragmatic Play who provides deluxe slot and casino games at your favourite casino site. Suit yourself to start the fun on this game. Log onto your account at Moon Games to play Chilli Heat Slot. This zesty slot game offers five-reels packed with high quality symbols. To be awarded a win, you will need to line three or more matching symbols along a pay line. Of course, features are here to aid you to amplify your potential wins. Begin the fun by setting up the stakes of your choice and proceed by clicking the spin button. Easy-peasy, isn’t it? Bet Levels: Chilli Heat Slot does not offer any Bet Levels. Yet, you get to choose the number of coins you play per round. You can set it from a minimum of 1 up to a maximum of 10. Amount of Paylines Selection: There are 25 pay lines offered on Chilli Heat Slot. These lines are always covering up your chances of wins. As such, they are all active throughout the game. Coin Values: Talking about coin values, you can choose from a minimum of 0.01 up to a maximum of 0.50 per round. To set the values, click onto the plus or minus button just next to the Spin Button. This allows you to access the betting options. It is so user-friendly that you will be done in a jiffy! Yes, there is a Wild Symbol on Chilli Heat Slot. That is the Chilli Heat Slot logo. In fact, this symbol can substitute for any other symbols of the game except for Scatters and Money Bag Symbols. Notice the sun Symbol? That is the Scatter Symbol of the game which appears only on reels 2, 3 and 4. This special symbol helps in the activation of the Free Spins Feature. The special money bag symbol is represented by the golden pouch symbol. Each time you land the Money Bag Symbol, it will take a value. These can award you a Major Jackpot or a Minor Jackpot. Obtain six or more Money Bag Symbols to activate this feature. All symbols except Money Bags Symbols are removed from the reels. You will have 3 re-spins to obtain additional money bags. Each time new money bags appear, the re-spin count resets to 3. The feature ends when the whole reel is filled with Money Bags or the re-spins end. You will then be awarded the price mentioned on all Money Bags. This can also include the Grande Jackpot. Get three Scatters to start the Free Spins Features with 8 Free Spins. Each time any additional combo of 3 Scatters will award you an extra 8 Free Spins. To note, there are only high paying symbols during the Feature. Nice, right? Good luck in grabbing your money bags or spicing it all up with some chillies on Chilli Heat Slot.